Elke Rogersdotter defended her doctoral dissertation entitled ”Gaming in Mohenjo-daro – an Archaeology of Unities” on Saturday 5 February 2011. The faculty opponent was Dr. Eva Myrdal, the Museum of Far Eastern Antiquities, Stockholm. The thesis deals with the traditionally neglected concept of ’play and pleasure’ and its impact on past social structures. The thesis examines game-related finds with the aim of reaching and discussing the social influence of the dimension of play in an ancient settlement. The finds originate from the Bronze Age Indus Valley settlement of Mohenjo-daro in Sindh, Pakistan, the largest, urban settlement of the Bronze Age Indus Valley cultural complex (Integration Era ca. 2600-1900 BC). The site has produced a number of game-related artefacts (dice, gaming pieces and others). Selected finds have been analyzed through museum studies in Karachi and Mohenjo Daro, as well as via elderly, written sources such as field reports. Read the full-textdoctoral thesis. The study has also involved a field documentation of engraved game boards at the ancient site of Vijayanagara (Karnataka, India), the ruined capital of the Hindu empire Vijayanagara (ca. 1350-1565 AD). This study was conducted within the framwork of the Vijayanagara Research Project (VRP). She is now working as a postdoc at the Department of Archaeology and Ancient History at Uppsala University. Elke Rogersdotter defended her licentiate thesis on the same issue at the Dept.of Archaeology, Umeå University on 14 March 2006. Parts of the thesis were included in a university lecture on Harappan and Gandharan toy- and play artefacts held at the Hazara University, Mansehra, NWFP, Pakistan, June 2007. 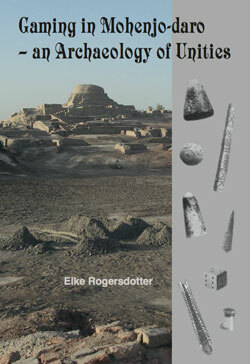 In a slightly revised form as to language and content, the licentiate thesis was published as a book in July 2008 by the German publishing house VDM Verlag Dr. Müller under the title: Socializing Children’s Toys: An Archaeological Inquiry into Third Millennium BC Harappan Terracotta Remains from Gujarat, India. The collecting and preliminary analysis of relevant material was made possible by contacting and visiting the Dept. of Archaeology at the Deccan College in Pune, as well as at Dept. of Archaeology and Ancient History, Maharaja Sayajirao University in Baroda. The work was carried out particularly under the supervision of Dr Vasant Shinde (at the Deccan College), and Prof. Kuldeep K. Bhan, Dr K. Krishnan and Dr. P Ajithprasad (at the Maharaja Sayajirao University). Dr Ajithprasad has acted as one of the co-advisors during the writing up of the thesis. She has also got assistance from Professor Emeritus Asko Parpola, Institute for Asian and African Studies, University of Helsinki, Finland, and Prof. Mark Kenoyer, Dept. of Anthropology, University of Wisconsin, Madison. Prof. Kenoyer is Head of the Harappa Archaeological Research Project, begun in 1986 as a long term program of investigations into the origins and character of Indus urban centers (it is the first multidisciplinary excavation of an ancient Indus urban center and involves scholars from all over the world). PhD Candidate Sidra Gulzar comes from Pakistan. The area of her interest is study of ancient civilizations, Urbanism and ancient trade and economy. She started her PhD studies from September 2011 and expected to finish before July 2015.The title of the PhD project is entitled ”Ganweriwala: A regional Analysis of Indus urban centers and Political Economy of Harappan Society”. Abstract: Indus valley civilization is world´s largest political denomination which is known of its splendor vast cities like Moinjodaro and Harappa. Indus valley sites widely spread in Pakistan, Afghanistan and India. Pakistan is very important country regarding the urban phase of Indus Valley Civilization. Now Archaeologists are dealing with five major urban centers of Indus Valley from which three are situated in Pakistan Moinjodaro, Harappa, Ganweriwala. One of the very important and hot debated issue is the discovery of “Ganweriwala” city in Cholistan region. Cholistan desert is situated in Bahawalpur district and is a rich area of unexplored Indus valley sites of all period of Harappan civilization. The subject of my Ph.D research is a totally neglected ancient Indus valley site “Ganweriwala” which is nearly equal in size with Moinjodaro and Harappa. My thesis will be a contribution in rank size analysis of major urban centers of Indus Valley, Inter regional connections of urban centers and similarities and differences of recovered material from “Ganweriwala” both with Harappa and Mohenjodaro.